MS is a disorder of the central nervous system (CNS) which includes the brain, spinal cord and optic nerves. The CNS is responsible for our conscious and unconscious functioning, including movement and the response to sensations such as sight, touch and hearing. It directs these functions by sending its instructions in the form of electrical impulses to the appropriate sites along nerve fibres. Nerve fibres are coated in a protective insulating covering called the myelin sheath�this serves a very similar function to the coating around electrical wires. Myelin is important in speeding electrical conduction along nerve fibres and in insulating nerve fibres from one another. The term multiple sclerosis refers to multiple areas of scarring (sclerosis) scattered throughout the brain and spinal cord. These scars are the result of healing patches of inflammation that are the basic cause of damage to nerve fibres and of the suddenly appearing symptoms that are referred to as an attack, exacerbation or relapse. Patches of inflammation heal spontaneously over several weeks or months when symptoms may resolve completely or residual impairment may result, if they do not. The inflammation causes damage particularly to the insulating myelin sheath covering nerve fibres, but also damages the nerve fibres (axons) themselves. 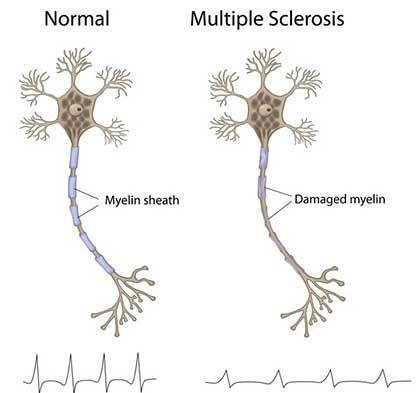 In MS, the typical damage is often referred to as "demyelination�. The nature of the symptoms and their severity depends partly on the site of the patch of inflammation (or lesion) and partly on its nature and intensity. The course of MS varies widely from person to person. Some people will only ever experience mild symptoms over their lifetime while others will have relapses followed by incomplete remission when disability may worsen in a stepwise fashion with each relapse experienced. A number of people experience slowly progressive, worsening of disability over many months or years. There is uncertainty how much of this progressive process is due to low-grade inflammation and how much to loss of previously damaged nerve fibres. Website designed and powered by Cohesion © 2019 Bay of Plenty Multiple Sclerosis Society. Photography by Patrick Kear.